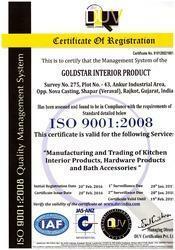 Incepted in the year 2009, Goldstar Interior Product is engaged in manufacturing and exporting of Stainless Steel Kitchen Baskets, Modular Kitchen Unit, Stainless Steel Rack, Stainless Steel Dustbin etc. Offered products are designed and manufactured using the finest quality raw material with the high level of precision in order to meet set quality standards. The offered products are highly appreciated by our clients for features like corrosion & abrasion resistance, high durability, vigorous construction, high tensile strength and fine finish. Available in various specifications, these products can also be customized according to the need of the clients. We manufacture these products under the brand Goldshine. Under the guidance of our mentor, Mr. Jitubhai Patel, we are profitably progressing in the industry. His extensive industry experienced and acquaintance facilitates us to meet clients’ exact requirements in an efficient manner. Backed by dedicated and enthusiastic professionals, we are manufacturing high quality hardware products to our esteemed customers. Selected through strict recruiting assessment, we have hired the best professionals from different domains. Hold vast experience in their individual domains, our professionals hold in-depth knowledge of this industry. They work in a coordinated manner with the clients to meet their specific requirements. Attain organizational goals in an efficient manner within stipulated time frame, our professionals endeavor hard to provide optimum satisfaction to the clients. Owing to our rich industry experience and knowledge, we have been offering a high quality range of Stainless Steel Kitchen Baskets, Modular Kitchen Unit, Stainless Steel Rack, Stainless Steel Dustbin etc. We have a well-structured and high-tech infrastructure that enables us to perform our manufacturing process in a tranquil manner. It is spread across a wide area and is segregated into diverse units like manufacturing, quality testing, R & D, warehousing & packaging, etc. Works in a streamlined manner, these units are well-equipped with hi-tech machines and highly developed technologies. These units are supervised by our experienced professionals and make certain comfortable and trouble-free the production process.